John Kerr, an engineer and machine maker, established Douglas Foundry in Blinshall Street, reputed to be one of the largest and most successful in Dundee. He gained a wide reputation as a man of great skill in his profession. Before embarking in business on his own account, John Kerr, as a young man, reputedly spent some time in the employment of Messrs Carmichael, engineers, as a journeyman mechanic. It was reported that he then commenced business as a millwright and machine maker in Dundee. Subsequently, he assumed William Umpherston as a partner, creating a new firm titled 'Umpherston & Kerr.' The new firm prospered and their business rapidly extended. In 1837-38, Dundee Directories listed 'Umpherston & Kerr' as 'millwrights and machine makers,' operational from Mill Street, West Ward, the forerunner to Douglas Foundry in Blinshall Street. The original Douglas Foundry started business in Blinshall Street around 1834 - the beginning being on a very small scale and giving employment to only a few men. Kerr's partner, William Umpherston, died in 1846. Thereafter, John Kerr, around 1848, formed a partnership with his brother, William, and also Mr William G Thomson, who had been in his employ. Their firm, styled 'John Kerr & Co,' carried on a most extensive business. Their business at Douglas Foundry manufactured machinery for various industries, including the jute trade. They continued, unabated, until 1866 when the Messrs Kerr retired and left the undertaking to Mr W G Thomson, who took his brother into the company with him. John Kerr was the son of William Kerr, currier and shoemaker, and his wife, Isabel Coathill/Cuthill. Little is known about John Kerr’s personal life other than his marriage to Helen Enverdale on 4 October 1832 and that the couple had two daughters, Helen, who died in infancy and Isabella. Kerr and his family seemed to have lived quietly but daughter Isabel’s marriage in October 1863, to Middleton Rettie, her second cousin and an advocate in Edinburgh, was cause for a big celebration. Workmen decorated the factory with two floral arches, one at the main gate together with flags, including the Union Jack, hung from every window. All of ‘John Kerr & Co’s’ factory workers (three hundred men) were invited to supper at the Corn Exchange in Dundee, to celebrate the wedding. Tables were laden with food, wines and spirits and the firm’s junior partner, W.G. Thomson, raised toasts. The evening’s entertainment included Scotch airs played by the Dundee Quadrille Band and songs, recitals and tunes from the workmen themselves. ‘John Kerr & Co.’ at Douglas Foundry manufactured different types of machinery needed for the many mills operating in Dundee, ranging from power looms and spinning machines to turbines and hydraulic presses. Long standing manufacturing firms were well recognised for their flax spinning and weaving machinery. However, ‘John Kerr & Co,’ a much newer firm, became a strong competitor in the field with their calendering machinery. The firm was so successful they exhibited a five roller calender, for finishing cloth, in section seven of the International Exhibition in 1862. The estate of Dunearn, near Burntisland, was purchased in 1865, at auction, ‘under articles of Roup, from the trustees of the late Joseph Young,’ by John Kerr, for the sum of £7,500. Providing a commanding view over the Firth of Forth towards Edinburgh, John Kerr spent his short retirement enjoying the pleasures of Dunearn. He had enjoyed a lengthy, professional career and was reported to have held an ‘honourable position in this town (Dundee) and the respect and esteem in which he was held, not only in this neighbourhood but throughout 6 or 7 counties,’ identified him as having been an upright citizen. 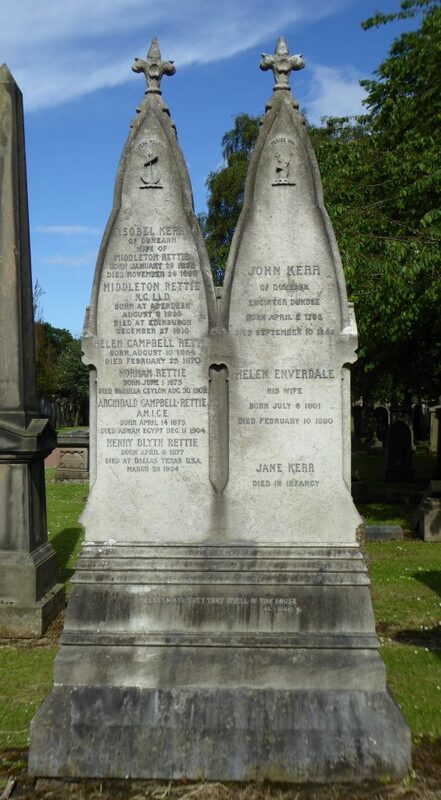 John Kerr died at Dunearn, Fife, on 10 September 1868. He was buried at Grange Cemetery in the City of Edinburgh with his family and the Rettie family, as the grand gravestone pictured depicts. Old Parish Registers. Montrose. Births. (1796). 312/ 50 159. ScotlandsPeople website. Kerr, John. Gravestone, Grange Cemetery. Findagrave.com website. Census Returns. Dundee. 1st District. (1861). 282/1 19/ 1. ScotlandsPeople website. Old Parish Registers. Dundee. Marriages. (1832). 282/220 90. ScotlandsPeople website. Legal Records. Wills and Testaments. Cupar Sheriff Court. (1868). SC20/50/40. ScotlandsPeople website. Dundee Directory, 1842-43. p.42. Dundee Central Library, Local Studies. Dundee Directory, 1850. p.116. Dundee Central Library, Local Studies. Valuation Rolls. Dundee. (1865). VR009800015-/290. ScotlandsPeople website. Fife Herald. 7 September 1865. p.3. British Newspaper Archive website. Statutory Registers. Deaths. (1868). 411/ 52. ScotlandsPeople website. Dundee Choral Society Honorary Members. Friends of Dundee City Archives website. Dundee Directory, 1861-62. p.160. Dundee Central Library, Local Studies. Dundee Directory, 1837-38. p.83. Dundee Central Library, Local Studies. Dundee Directory, 1842-43. p.84. Dundee Central Library, Local Studies. Grace's Guide to British Industrial History Website. https://gracesguide.co.uk website. Dundee Advertiser, 23 October 1863, p.3. British Newspaper Archive website. Warden, Alexander Johnston. The Linen Trade Ancient and Modern (Second Edition). (1864). London. Longman. p.754. The International Exhibition of 1862, p.10, Boston Public Library website. Dundee Advertiser. 11 April 1862. p.4. British Newspaper Archive website. Dundee Courier. 23 October 1863. p.3. British Newspaper Archive. The information above about John Kerr has been collated from a range of digital and hard copy sources. To the best of our knowledge it is correct but if you are relying on any information from our website for the purpose of your own research we would advise you to follow up the sources to your own satisfaction. If you are aware of an inaccuracy in our text please do not hesitate to notify us through our Contact page.